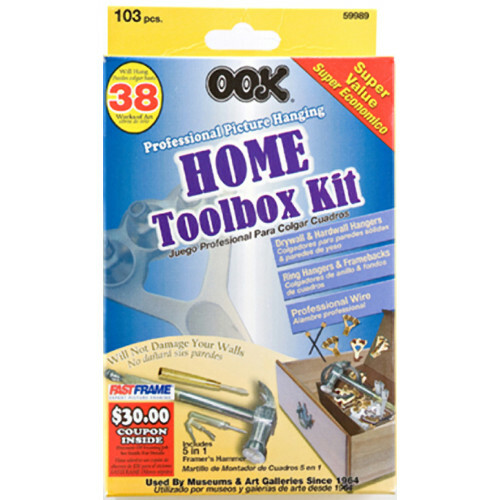 OOK Home Toolbox Kids are ideal for drywall and sheetrock Great for storing in drawers or tool boxes. Ideal for drywall and sheetrock Great for storing in drawers or tool boxes. Included in this kit: (2) 20lb hangers, (2) 50lb hangers, (1) 100lb hangers, (2) 30lb hangers, (11) professional blue steel nails, (18) 20lb hangers, (13) 50lb hangers, (2) large sawtooth hangers, (2) D-rings, (1) framer's hammer.